July 19, 2013. 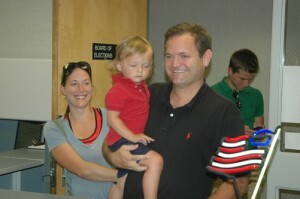 It was an exciting morning at the Watauga County Board of Elections’ office. Candidate filing for the upcoming municipal elections ended at noon, and before the clock struck 12, seven candidates filed for municipal races in Watauga County on Friday. John Mena, owner of Haircut 101, and Brad Harmon, owner of Dixie Pride, filed their candidacy for mayor of Boone. Both are downtown business owners. With incumbent Mayor Loretta Clawson already announcing that she isn’t running for re-election and incumbent Council Member Andy Ball having filed for mayor on the first day, three people are vying the town’s mayoral position. Mena, who is registered unaffiliated, said the races are supposed to be nonpartisan. Although he said both Republicans and Democrats make “valid points,” he said party politics have made Boone “stagnant.” He said he wants to make Boone progressive. He said he didn’t decide to run for mayor until 15 minutes before he filed for the election this morning. See a prepared statement that was published previously from Ball. Three people filed for the Boone Town Council races on Friday – James Milner, Matthew Capehart Long and Mark Templeton. Milner and Templeton are registered as unaffiliated and Long is registered Republican. Long is a partner with the general contractor Capehart and Washburn, LLC, and arrived to the Watauga County Board of Elections’ office with Mena. Long said he ran for a council seat four years ago and is currently on the Boone Area Planning Commission. Templeton was the last person to file, walking through the door 15 minutes ‘til noon with his wife and two children in tow. After filing, Templeton noted that he was born here, that he loves Boone and Appalachian State University. “Anytime you can contribute to the process, it is a good thing,” Templeton said in a brief statement in the lobby of the courthouse. Two weeks ago on July 5, the first day of filing, three progressives filed for Boone Town Council: Jennifer Pena, Quint David and incumbent Rennie Brantz. Read their prepared statements here. This leaves six council members vying for four seats on the Boone Town Council. High Country Press reported yesterday that incumbent Blowing Rock Mayor J.B. Lawrence would have some competition after Dan Phillips, currently a member of the Blowing Rock Town Council, filed for the mayoral position. While no other candidates filed for mayor, one more candidate did file for Blowing Rock Town Council on Friday – David Barker. Barker is registered unaffiliated. With Phillips running for mayor while he still has two years of his council term left and Barker filing, that leaves six people running for four open seats on the Blowing Rock Town Council. Douglas Matheson, Tommy Klutz, Laurin Carter, Ray Pickett and Sue Sweeting have already filed for the council. The last Beech Mountain person to file for the municipal elections was Barry Schorr, who is registered unaffiliated. This means five people are running for three seats on the Beech Mountain Town Council. Previously, incumbents Paul Piquet, Cindy Keller and Rick Miller filed along with Eddie Plante. Come November, there will be no surprises atop Seven Devils. All three incumbents up for election on the Seven Devils Town Council filed for re-election, and they were the only people to file for the Seven Devils Town Council. Click here for a listing of whose seats are up for election in the county.